WILL CHIP UP TO 3" DIAMETER. DISC-STYLE CHIPPER. 64" LONG FEED TABLE.INFEED OPENING 6" X 6" - 27 HP GASOLINE TOWABLE UNIT. 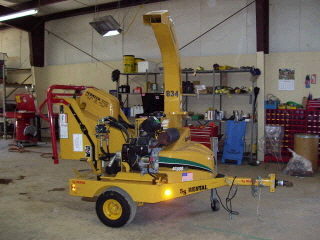 * Please call us for any questions on our chipper brush 6 inch rentals in White Oak, Longview, Gilmer, Gladewater, Big Sandy, Kilgore, and all of East Texas.